Free apps? Now that’s what I call “app-ealing”! Free apps, games, and resources that can help you and your students? That’s even better yet! Submit a comment to the blog by 11:59 pm EDT Sunday, July 19, 2015, to tell me which of the freebies below are your favorites. One lucky teacher will win two animal-themed books. Here’s an offer you’ll want to take advantage of right away. To celebrate its success, the Who Was? Adventure app is free for the month of July only. This fun app is like a mash up of Tetris and a trivia game about historic figures and pop icons. Based on the best-selling Who Was? biography series, the app tests knowledge with more than 4,500 questions. Check it out here. Gather your Post-It notes from a collaborative work session and keep the momentum going (and organized!) with the free Post-It Plus app. Here’s how it works. First, capture the Post-It notes from your work session by taking a picture. You can capture up to 50 notes at one time. Organize the notes on your board by thought or simply set them up on a grid. Share your organized board with your team. Learn more here. Question: It adds the fun of a game to classroom learning. Answer: What is the free Jeopardy Rocks online game? 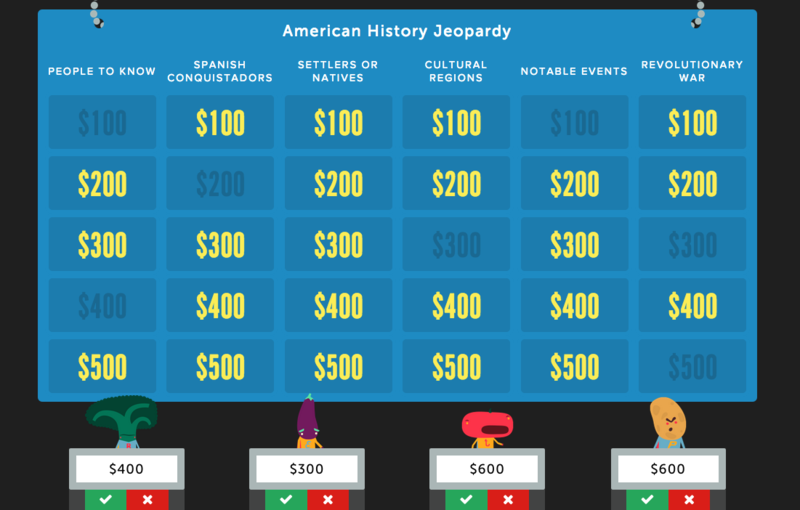 You can customize your own Jeopardy game to help your students learn. The directions let you enter a custom URL and password and then your questions and answers. Up to four teams can play at once, and you can share your URL with other teachers. Get more details and play a demo game here. Have you checked out DKfindout! yet? it’s a new, free online encyclopedia geared to students ages 7–11. It has more than 300 animations and sounds; 9,000 photos; 100 videos; and 3,000 articles. A teacher’s section includes resources and ideas for projects and homework. Take a look here. Don’t forget; submit a comment for your chance to win the books! Oh my gosh the post it app for sure. I am always writing on post its and sadly sometimes lose them. I am downloading this for sure . I love the DK Find Out. I can’t wait to use it! The Jeopardy Game is so versatile! I can even use it for a quiz about prospective colleges! Oh my, I love free apps! So many of my teachers are looking for ways to engage with technology and are hoping to gain greater personal understanding of ways to use it. The post-it app will be perfect for the upcoming large group training! I love the DK Find Out! My students will use that a lot this year! Melissa’s Octopus wins my vote. Every year my class loves pets of all kinds. I love the DK app. Can’t wait to try it with my students on the iPads. Students always need a comprehensible and comprehensive research source and DKfindout! fits the bill. These are all great resources! My daughter is a huge Who Was? fan and just downloaded the app. So very exciting to get to try it for free! I love free apps! I just downloaded the Who Was? Adventure app. My kiddos will love it! I love the DKfindout. What a great resource. Thank you for always sharing the wonderful new and exciting finds with us! The Post It Plus app will be awesome for reading class. I can see us using this is so many ways. Thanks so much. It made me h”appy”!